The opposition leader said this week that the next Federal Election will be a referendum on wages & the Reserve Bank Governor was saying he couldn’t understand why wages weren’t going up more given the underlying strength of the economy. Michael McLaren of 2GB Radio is joined by the Hon. Kelvin Thomson, former Federal Member for Wills now advisor for Sustainable Australia Party’s Clifford Hayes to talk about Bill Shorten’s declaration that the upcoming election will be a ‘referendum on incomes’. Michael is joined by the Hon. 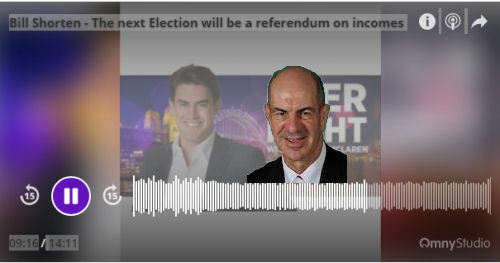 Kelvin Thomson, former Federal Member for Wills now advisor for Sustainable Australia Party’s Clifford Hayes to talk about Bill Shorten’s declaration that the upcoming election will be a ‘referendum on incomes’. The opposition leader said this week that the next Federal Election will be a referendum on wages & the Reserve Bank Governor was saying he couldn’t understand why wages weren’t going up more given the underlying strength of the economy. This seems a remarkable thing for him to say given that the answer is obvious… that Australia’s high migration program of the last 15 years has provided a pool of surplus labour which is used by employers to keep wages down. Yesterday’s commentary by the Reserve Bank Governor suggested that the issue was not confined to Australia, and that it was a 21st century phenomenon. Other Western countries have also seen employers using “open borders” to keep wages down, and in Australia’s case the migration numbers took off from around 2004 – so yes it has been a 21st century development. Good luck with fighting the next election on WAGES ("Bill Shorten grasps the most powerful issue yet", CT 9/3). Beyond the Canberra Bubble, out on the hot, dry, western plains, the huge refrigerated warehouses of Laverton distribute food to the rest of Melbourne. I've driven trucks from there, on and off for the last seven years. 95% of all new truck driver hires are Indian and Pakistani international students, most graduates with business or accountancy degrees. They get their start promising to work five days for four days pay. And for all I know, might still be working 5 for 4 through labour hire companies. Before that, I worked at the then brand-new multistory Bunnings in Hawthorn. 155 out of a total staff of 165 were international students. Big business loves them because they're docile, keen and computer literate. A job means permanent residence. Alas they knew zilch about hardware. And now in Melbourne's inner south, insects might be decimated, but we have a plague of bike food delivery drivers for Uberfood, Deliveroo and such. They admit to earning $5 an hour and having to provide their own scooter. 100% international students. Mass migration makes all our social problems worse. Wages are the least of it. If you're thinking of going to that event, note there is a discount offer at the end of this article. The article argues that different surveys come up with different results. But the only one suggesting majority support for current immigration is the Scanlon Foundation "mapping social cohesion" survey, which carefully avoids reference to the quantity of immigration, making it hard for people to answer against the question without seeming to hate all immigrants.